Anarkali suits have been around since the Mughal times. It is believed that Anarkali was a courtesan in the royal court of Emperor Akbar. She was immensely beautiful and had plenty of admirers. Nevertheless, she fell in love with Salim (Jehangir), who was the prince. Sadly, their love never blossomed because of class difference. As a punishment of loving the prince, Emperor Akbar ordered that she be walled up alive. As her love was true, she accepted the decision, an act, which not only immortalized her but also everything related to her. It is widely said that she wore a variation of the traditional churidar suit. The kurta or the upper garment used to be tightly fitted until the waist and then the fabric would fall freely and reached the ankles. With multitude of pleats, it looked very graceful especially when Anarkali danced. The lower garment used to be churidar with many folds stacked together at the ankles. Since she wore this dress and carried it off with panache, the name Anarkali Suit struck. 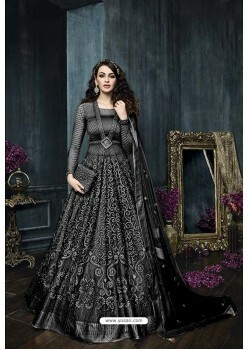 Why Anarkali Suits are such fashionable attire? Usually, old style dresses hardly meet the style standards of today. Nevertheless, this traditional attire immediately caught the attention of many when Madhubala played the role of the courtesan Anarkali in the movie Mughal-E-Azam. Since then, on and off, this garment can be spotted at various events. Recently, Anarkali suits have become a rage and a host of actresses can be seen wearing them. Consequently, women, who wish to stay on top of fashion, also look for these suits. You can find the best variety of the suits at YOSARI. The collection is splendid with new designs being added regulary. How does this attire flatter the body? No matter the kind of body measurements you have been endowed with, you will never go wrong with Anarkali Suits. The dress is made in such a way that it lends a graceful appearance to every body type. In fact, even pregnant ladies can wear this attire, feel comfortable and look pretty - all at the same time. - If your height measurement ranges between average and tall, then you should go for a full pleated look of the kurta. However, if you are shorter then choose one that has a limited number of pleats. - As kurtas of this outfit are all ankle length, women of short and average height may appear shorter in them. A simple remedy is to wear heels, which will raise the height and maintain it. - If you are plump then you should ditch the traditional Anarkali Suit look. Rather, you should try its new avatar where the bust does not appear demarcated and the pleats begin from the top. At YOSARI, the collection of Anarkali Suits is huge, which will help you select the best type as per your body measurements and height. What are the different kinds of Anarkali Suits? Well, this garment can be broadly divided into 3 categories. They are the hottest trendsetters worn by contemporary actresses like Katrina Kaif and Anushka Sharma. You will spot them wearing the dress at a host of award functions, cultural programs and in daily soaps in a special appearance. The typical features that these outfits have include heavy embroidery work along the neckline, border of the kurta and on sleeves. The fabric used includes chiffon, silk, satin combined with organdy and net. The most prominent attribute of these outfits is the use of heavy embellishments. The fabric is made attractive with patchwork, embroidery with gold wires, lace work, and beadwork. In many of the dresses, precious stones are also used. 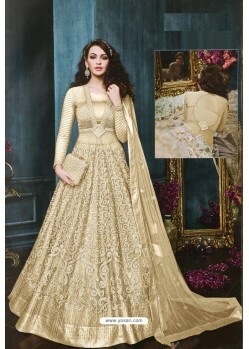 The main aim of designing a party Anarkali is to make it shine and shimmer. You will find the garment in a single color as well as in multiple hues. Dupatta with it is not mandatory. Mostly, dupattas are substituted for heavily decorated waistcoats. These dresses have traditional patterns on them and again, feature a substantial use of embellishments. Conventional decoration like zariwork, gota work, beading, embroidery with gold thread can be seen on the fabrics. They generally portray a single color, which could be red, golden, silver, white, peach, deep blue, pink, etc. Decorated dupatta is usually a worn by the bride, as it completes the attire and makes the bride look delicate. Anarkali Suits are very popular and that is why they are widely available. Nevertheless, as these garments are made of exotic materials, you should purchase them from a trustworthy online shop like www.yosari.com. It is an online place where a wide variety of Anarkali Suits of every kind is available. Moreover, with our large clientele, we can assure you that the garments are made of superior quality materials. We are confident of the high quality of our clothing items. However, we value our customers’ opinions more. Thus, if in any case, you found the item not matching to your expectations, you can return it and can take a full refund from us. We will not ask any questions. Our delivery locations are not only in India. We have clients hailing from different parts of the world and we proudly deliver in Australia, Canada, UK, and the USA.